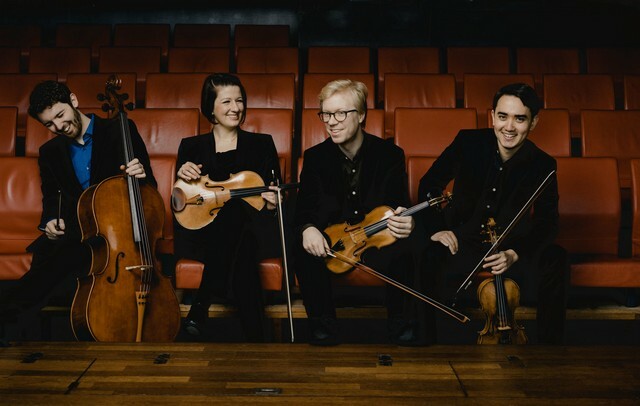 Marmen Quartet were the inaugural winners of Music In The Round's 'Bridge' scheme, as well as the 2018 Annual Royal Overseas League Competition and the Royal Philharmonic Society Albert and Eugenie Frost Prize. They were selected for the Musicians Company Concerts Concordia Award for 2018/19, featured as a Selected Artist with Making Music for 2017 and are Ensemble in Residence with Salomon Smith Chamber Music Society in Sweden. Performing regularly in venues around the UK and internationally, they were founded at the Royal College of Music, London, in 2013. They consist of individually acclaimed musicians Johannes Marmen, Ricky Gore, Bryony Gibson-Cornish and Steffan Morris. Since its formation, the Marmen Quartet has enjoyed masterclasses with Alfred Brendel, Gunter Pichler, Rainer Schmidt and Eberhard Feltz and were mentored by Peter Cropper. They study regularly with Simon Rowland-Jones, Oliver Wille and John Myerscough at the Royal College of Music London and Hochschule für Musik, Theater und Medien Hannover. Their Artist Diploma degree at the RCM is supported by a legacy left by Albert and Eugenie Frost. Radio broadcasts include appearances on 'Swedish Radio' and 'BBC In Tune'. In the summer of 2017 they took part in Foco Boulez festival at the Teatro Colón in Buenos Aires, where they performed in a variety of programmes and settings as well as quartet recitals.